What a great way to give to charity! 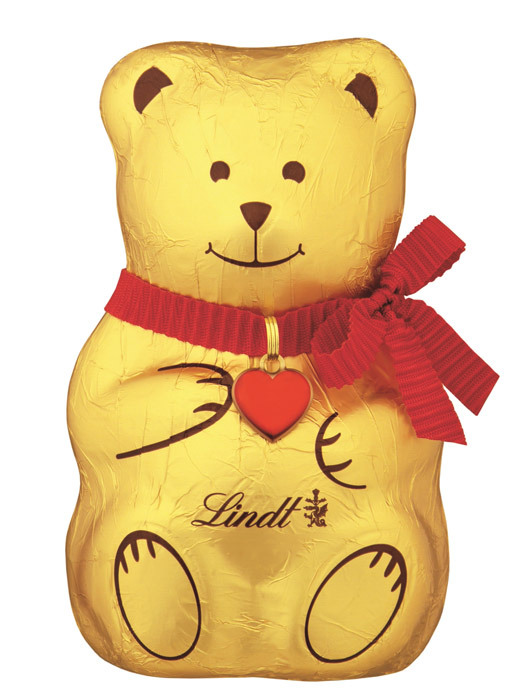 With its familiar cheery smile, loveable little heart and smooth milk chocolate body, the Lindt Bear makes the perfect treat. It’s also the perfect way to ‘show you care’, as the Lindt Bear is helping raise £100,000 for BBC Children in Need in 2012. Lovingly crafted by the Lindt Master Chocolatiers, each luxury chocolate Lindt Bear is a seasonal favourite that helped to delight thousands of adults and children after its launch last year. Wrapped in its distinctive golden foil and complete with keepsake heart and ribbon, it looks almost as good as it tastes. In the run up to the BBC Children in Need Appeal which culminates on 16th November 2012, there will be a special charity auction of limited edition porcelain Lindt Bears - each signed by a well known celebrity. Keep an eye out for more information and auction details at facebook.com/lindtuk. As well as the classic Lindt Bear 100g, there are also six other ways to ‘Show you care with the Lindt Bear’ this festive season, available from stores nationwide or online from lindt.co.uk. I do so love Lindt chocolate. Shall be keeping my eyes peeled for this little guy.